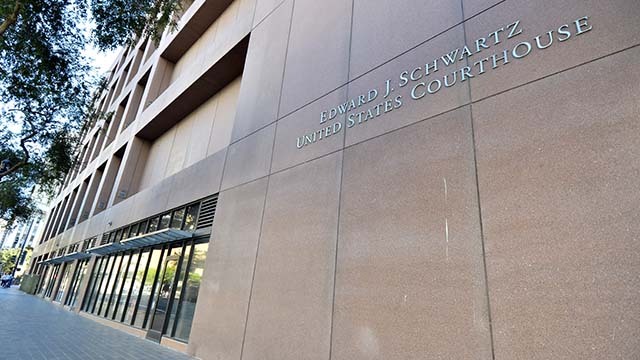 On the morning his insider trading trial was slated to begin in U.S. District Court, a San Diego man pleaded guilty to conspiracy, with his plea coming just days after his co-defendant was convicted of the same charge by a federal jury. Stockbroker Paul Rampoldi, 50, of San Diego was found guilty Friday after the federal trial, and his client, Scott Blythe, 53, pleaded guilty Monday in the case, which involved an illegal trade based on an insider tip about the 2012 merger of San Diego-based Ardea Bioscienses with multinational pharmaceutical company AstraZeneca. The federal jury found Rampoldi guilty of conspiracy to commit insider trading, wire fraud and money laundering, according to the office of Adam Braverman, U.S. Attorney for the Southern District of California. The jury was unable to reach a verdict on two other charges against Rampoldi. Blythe entered his guilty plea Monday morning just before his trial was set to begin. According to Assistant U.S. Attorneys Aaron Arnzen and Emily Allen, Blythe admitted in his plea agreement that the insider tip originated from another co-defendant, Michael Fefferman, who was then director of information technology for San Diego-based Ardea. During Rampoldi’s trial, prosecutors told the jury how Fefferman, a 45- year-old Escondido resident, learned in April 2012 that Ardea was planning to merge with AstraZeneca. Fefferman knew the merger would boost Ardea’s stock price by 50 percent, and before the merger was announced to the public, he passed the news on to his brother-in-law, 43-year-old Lakeside resident and licensed stockbroker Chad Wiegand, who worked at National Planning Corporation. Wiegand passed the insider tip to his co-worker, 50-year-old San Diego resident Akis Eracleous, who finally passed the tip to Rampoldi and Blythe. In an attempt to avoid suspicion, the three agreed Blythe would trade on the information and they would split the profits. Fefferman, Eracleous and Wiegand were also charged with conspiracy, but each admitted involvement in the case and agreed to cooperate with the investigation. According to the plea agreement entered Monday, Blythe bought about $5,400 in risky Ardea stock options the Friday before the merger was made public. After the merger was announced, Blythe sold those same stock options for nearly $89,000. Blythe then paid $40,000 in cash to Rampoldi and Eracleous, plus $2,000 in cash to Wiegand as compensation for the insider tip. Rampoldi and Blythe are set to be sentenced May 25 by U.S. District Judge Dana Sabraw.